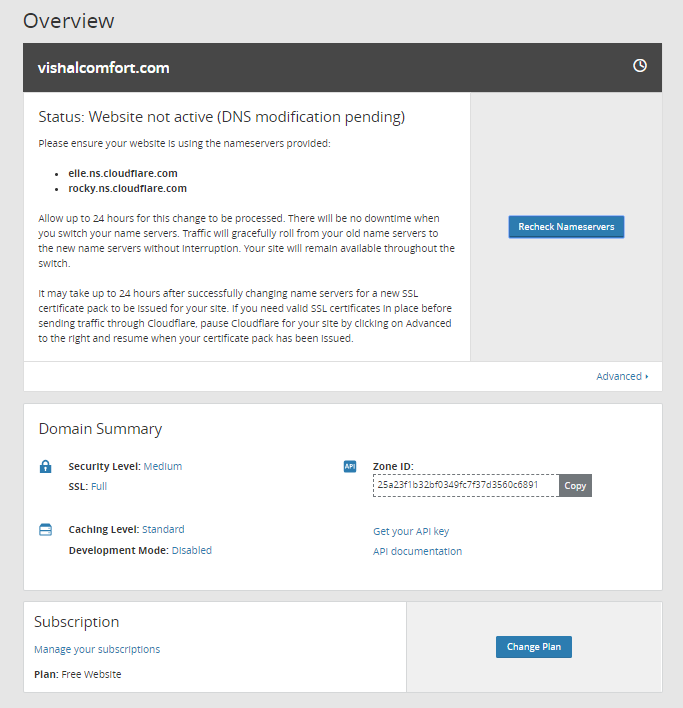 Pabbly Subscriptions has launched a new “Custom Domain Feature” which allows you to have your own custom domain for the Checkout Page. Each plan in Pabbly Subscriptions has a unique Checkout page link. and you want to use a custom domain like – “checkout.yourcompanydomain.com” for your checkout page. 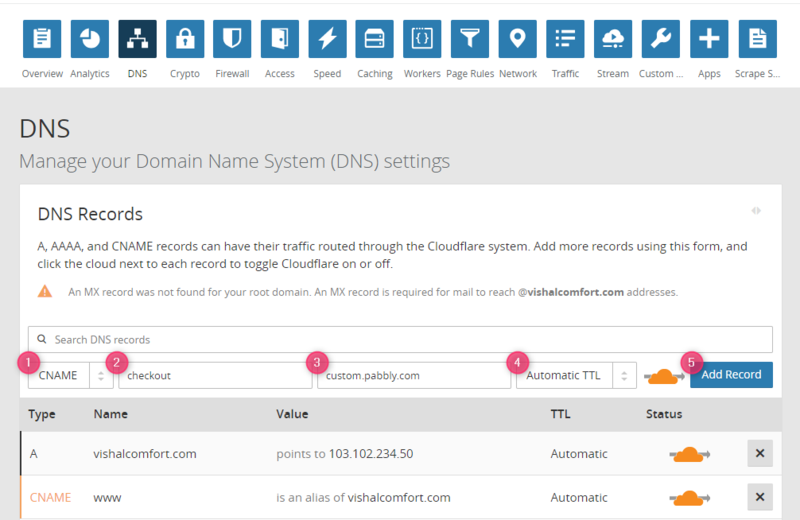 Add a CNAME record which points to “custom.pabbly.com” with the name of your custom domain. You can give any host name of your choice. For example, We are using “checkout“, as shown in the link below. Warning: If you are not familiar with DNS, please contact your DNS/Hosting provider before changing your DNS. Once you create a CNAME record on your custom domain with a value of “custom.pabbly.com”. Then contact us through the form link below and we’ll take care of the setup from there. The setup process usually takes from 24-48 hours. You will receive a confirmation mail after the setup is done from our end and you can then use your custom domain link for checkout page. You can use this link in place of the Pabbly checkout link on your website. Your custom domain is the subdomain of your website (domain). We create a new subdomain for your checkout page. A subdomain is a part of your domain but the changes/features on main domain do not get reflected on your subdomain automatically. All the feature of your domain and subdomain needs to be added one at a time respectively. In the same way, SSL on the main domain will not work for the subdomain. You need to activate SSL for the subdomain, In this case, Custom Domain to make sure your Checkout Page is secure. You requested a Custom domain as (https://checkout.abc.com). (https://abc.com) is your main domain and you have SSL activated for it. We created the custom domain as (http://checkout.abc.com). Since this is a subdomain, you need to activate the SSL to ensure your customer checkout data is safe. 1. Go to CloudFlare (https://www.cloudflare.com/), log in to your dashboard. Now, add your site after clicking on the “Add Site” button in the page. 3. It will redirect you to the plan, select one of the plan to add the SSL in your sub-domain. You can choose the FREE plan without having to pay anything. 4. Confirm the purchase, after clicking into the “Purchase” button. CloudFlare will scan your website completely and let you know about the missing records so that you can add them and complete the process to secure your website. 6. 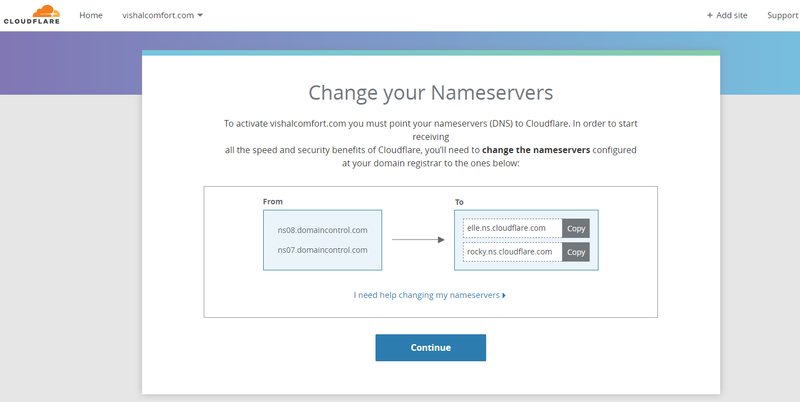 Change your nameserver from your current DNS provider. 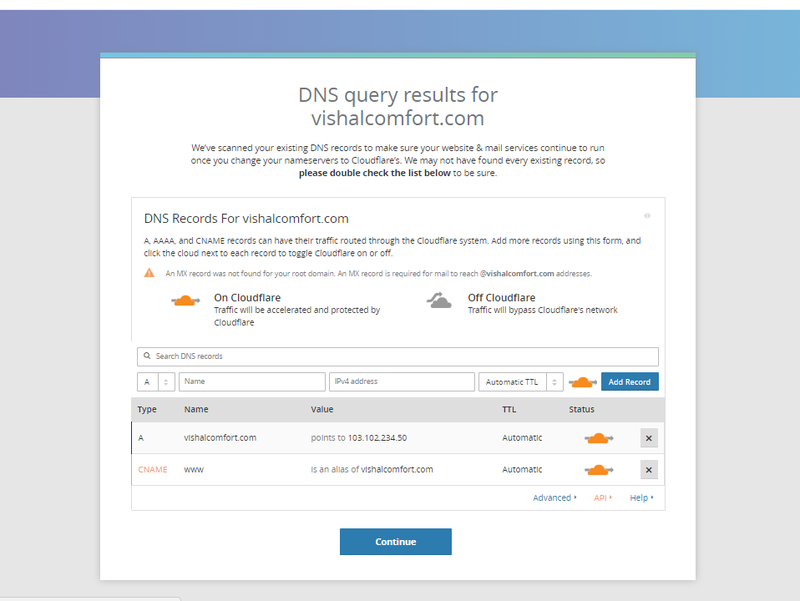 Your current DNS provider might be someone from whom you have purchased your domain name. For example Godaddy, NameCheap etc. 7. Once you have added the Nameserver, you can click on Recheck Nameservers button. 8. 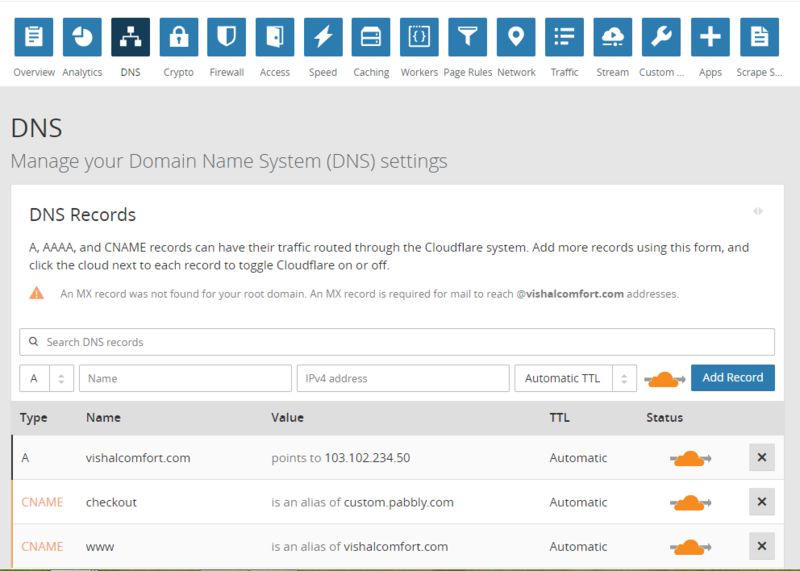 Once the Nameservers are added, you will see the Active mention on the CloudFlare Dashboard. 9. You can click on the name of the site and a settings panel will open up. Click on DNS menu on the top to open the DNS window. 10. Add the CNAME & it’s alias value and clicks on the “Add Record ” button. 11. 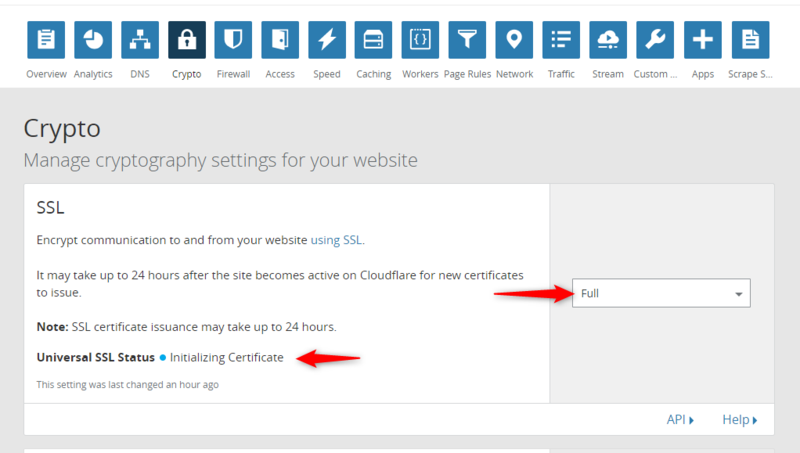 Now, click on the Crypto option to the submenu and select “Full” in the SSL part. The current status of your “Universal SSL” will be “Initializing Certificate”. 12. 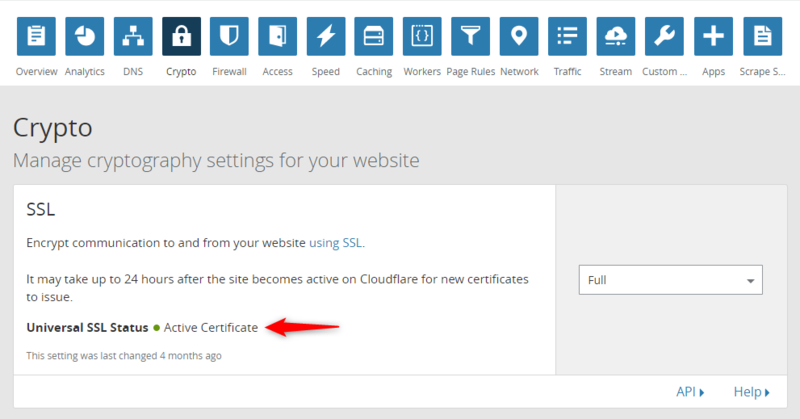 And once your DNS record will be added then the status of “Universal SSL” will be changed to “Active Certificate”.